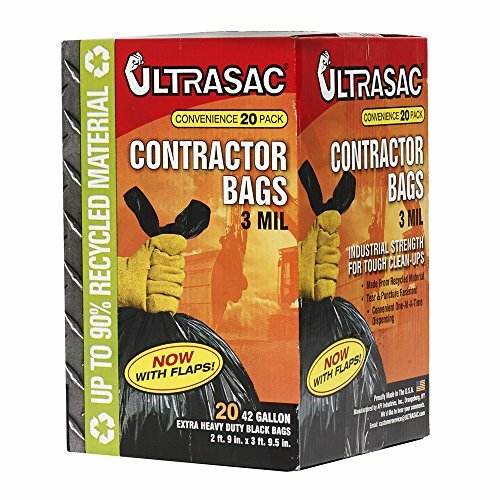 Aluf Ultrasac are made from at least 90 percent recycled material. Made with premium resins. Consistently steady favorite, extra thick black opaque bags are dependably strong. Bags are gusseted and individually folded, open easily and are packed in cube style dispenser cartons for easy storage in tight quarters. Commercial Quality at affordable prices for every job. Packed for value oriented retail sale. Great promotional products. Made in America. Easy to store in glove compartments, RV's, trailers or motorcycles. Great promotional products. 42 gallons capacity. Available in black color. Measures 48-inches length by 33-inches width by 3 mil thick.